Pokemon Heroes – Latios & Latias, 「水の都の護神 ラティアスとラティオス」(lit. “Guardian Deities of the City of Water: Latias and Latios”, officially “The Guardians of Alto Mare: Latias and Latios”) premiered in Japanese theaters on July 13, 2002 and in American theaters on May 16, 2003. This film rounds off the Original Series and paves the way for the next Advanced Generation movie group. Though the movies continued on their yearly production schedule, due to declining profitability, The Guardians of Alto Mare: Latias and Latios (hereby referred to as Latias & Latios) was the final Pokemon film shown in American cinemas for a very long time. Until the thirteenth movie, the rest of the films were, in America at least, direct to VHS/DVD or aired on television. There is a certain legend passed down in the island city of Alto Mare. Long ago, an old couple found two children injured along the beach. Feeling pity for the children, the couple nursed them back to health and raised them as their own. One day, an ancient evil attacked the island, threatening to devour it whole. The two children transformed before the eyes of the couple into their real identities as the Infinity Pokemon, Latios and Latias. They called their allies, and together the Latios and Latias drove away the ancient evil using the power of the Soul Dew, a jewel that houses incredible power. 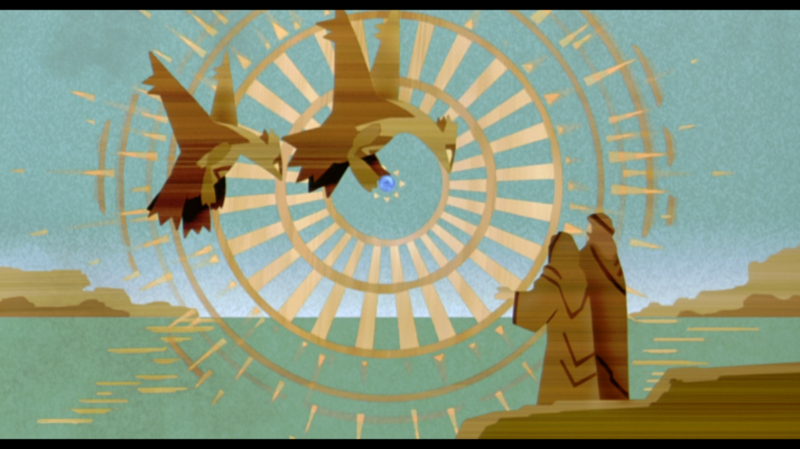 Since that day, the Soul Dew was kept safe in Alto Mare and Latios and Latias have been known to visit the island, bringing good luck to anyone who sees them. The film starts by introducing the main villains of the film, Zanner (called Annie in the English dub) and Lion (Oakley), two sisters who are master thieves. They have come to the island of Alto Mare to steal the Soul Dew and use its power to take over the island. In order to do so, they track down a Latias living among the residents of Alto Mare disguised as a girl. Satoshi (Ash Ketchum) and Pikachu, on the island to partake in the yearly festivities, manage to stop Zanner and Lion’s plans to capture Latias and the two safely escape. Latias takes Satoshi to a botanical garden hidden deep within the island, but Satoshi and Pikachu are attacked by Latios, who mistakes them for intruders. Latios’ assault is stopped by intervention by Latias, the curator of the Alto Mare museum, Vongole (Lorenzo), and his granddaughter Kanon (Bianca). Since Satoshi discovered the existence of Latios and Latias, Vongole explains that the garden houses the Soul Dew in order to make sure that it and the defense system that protect Alto Mare do not fall into the wrong hands. The legend says that should the Soul Dew be used for evil, the Soul Dew will be consumed and the city destroyed. Zanner and Lion find the location of the garden thanks to a spy robot they used to follow Satoshi and after Kanon guides Satoshi back to his lodgings, the sisters infiltrate the garden. Latios and Latias fight to stop Zanner and Lion, but their advanced technology stops many of their attacks. Zanner and Lion manage to ensnare Latios, but fail to secure Latias who makes an escape. Latias seeks Satoshi and together, they make their way to the Alto Mare museum, where the Alto Mare defense system is housed. Zanner and Lion unfortunately have already activated the system, and the Soul Dew, sensing their evil intentions, blackens and fades away, shutting the system down. Shortly after, a great tsunami threatens to submerge the island, but Latias and the recently freed, but badly injured Latios go to halt the tsunami with their powers. In the process however, Latios uses up too much of his energy. Knowing he cannot survive for too much longer, Latios sacrifices himself and transforms his essence into a new Soul Dew to keep the island from submerging. Satoshi, Vongole, and Kanon return this new Soul Dew back to the garden and the defense system of Alto Mare is restored to its original functionality. In my previous review, I lauded Celebi – A Timeless Encounter (hereby referred to as Celebi) as the great Pokemon movie I’d been wanting to see since the first Mewtwo Strikes Back (hereby Mewtwo). 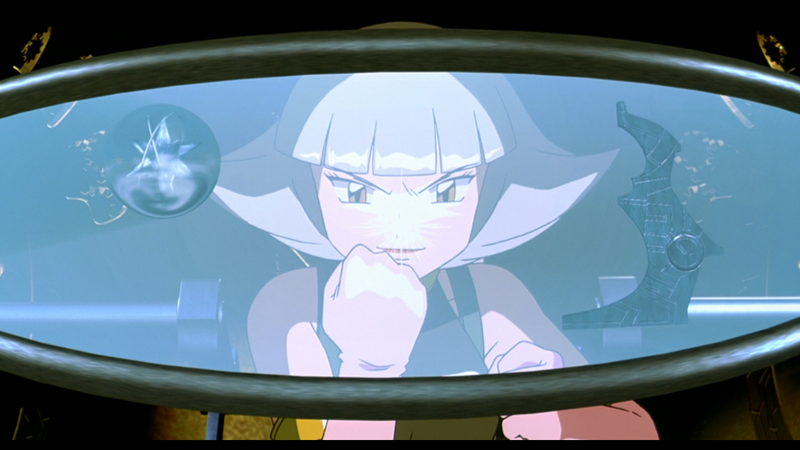 In Celebi, the core element that made Mewtwo such a success was rediscovered, namely that the titular Pokemon in these movies were multi-faceted characters rather than single dimensional plot devices. Celebi raised my hopes that the Pokemon Company had managed to get its act together and that ensuing movies would be of equally high quality. Did they succeed in figuring out the magic formula, or was Celebi another lucky accident? At first glance, Latias & Latios appears to adhere very closely to Celebi‘s strengths. The power of Latios and Latias is explained from the start in the form of a local legend. Latios and Latias are hunted by the main villains. Much like Celebi, neither Latios nor Latias speak a single word of human tongue. 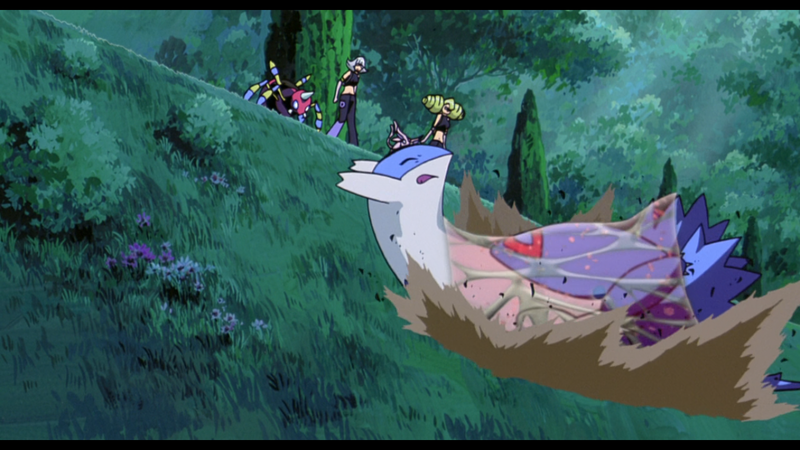 The titular Pokemon bond with the main characters through playful activities and ultimately, one of the titular Pokemon ends up dying in an attempt to evoke a response from the viewers. Actually, when you look at the very basic plot elements of both films, Latias & Latios is almost a one-to-one copy of Celebi. As the saying goes, why fix what isn’t broken? Unfortunately, the problem with recycling a formula is that simply copying does not yield any results unless you can figure out why it worked the first time. Though the creators had good intentions by so closely adhering to Celebi, the execution of Latias & Latios falls short. I’ll digress for a moment here to talk about the action scenes of the film. If you came to watch this film expecting a lot of cool Pokemon fights, you’ll be sorely disappointed. Not only are Pokemon battles sparse in Latias & Latios, the fights that do occur are incredibly short with little to no action within them. The quality of the Pokemon battles you find in Latias & Latios are barely a step above what you’d find in an average episode from the television anime, a big let-down for a theatrical experience. You could have easily experienced the same amount of cinematic intensity watching a few episodes of the television show at home. To get back to Latios and Latias themselves, it seems to me that the story writers thought it was crucial to have Latios and Latias seem weak and helpless to gain our sympathy. Ultimately, that tactic backfired. I certainly felt bad seeing Latios and Latias beaten down constantly, but it was in the same way that I pitied Lugia in the second Pokemon film. Lugia was also touted to be a majestic Pokemon hiding such immense power that he must hide in the depths of the ocean to contain it all, but he was ultimately brought to his knees by three Pokemon supposedly his inferior. Latios is defeated by Zanner and Lion. Something about this isn’t right. Likewise, Latios and Latias are beat by comparatively common Pokemon in Zanner and Lion’s Ariados and Espeon. These two legendary Pokemon can stop a tsunami, but they can still be taken down with spider-webs and psycho-kinetic powers that are inferior to theirs? Celebi’s vulnerability in the previous film was a bit like a Muhammad Ali rope-a-dope: The Pokemon was beaten up in the early parts of the film, but at the climax, Celebi showed its capacity for power and destruction. It didn’t work that way at all with Latios and Latias, whose weakness was more akin to a boxer thrown in the ring against an opponent two weight classes above them. The difference in their touted ability was too disconnected from their actual powers, and this kills a lot of the movie’s immersion. The second major weakness of the film — and its most crucial flaw — is its villains, Zanner and Lion. These two sisters are master thieves out to steal the Soul Dew. The movie presents from the get-go as carefree, stereotypical, spy movie femme fatales who, underneath an alluring appearance, hide a dangerous set of skills. These two are fine villains until about halfway through the movie, when Lion suddenly becomes power hungry upon hearing that the Soul Dew allows the owner to control the Alto Mare defense system. The disconnect between how Lion is originally presented and her sudden lust for power is just too great. In Celebi, the main villain, Vicious (The Iron-Masked Marauder), was a merciless jerk who would stop at nothing to obtain what he wanted. When he suddenly revealed that he wanted to subjugate the world using Celebi’s power, I don’t think anyone in the audience was surprised in the least. It fit his character based on how the film introduced him to the audience. Lion tripping on the power of the Soul Dew. She’s having a lot of fun with that Minority Report display. In Lion’s case, her desire to “rule the world” is almost shoehorned into the story. It’s as if someone on the writing staff realized that having the story just be about two thieves was not climatic enough to show off the power of the titular legendary Pokemon, so they had to rewrite her motivations halfway through. Like with the expectation vs. portrayal of Latios and Latias’ power, the disconnect between the personality and motivations we were lead to expect Lion to have and the power trip she goes on totally ruined the realism of the film and required too much suspension of disbelief to overcome. Celebi was a rather large step forward for the Pokemon movie franchise, which had backpedaled for two movies after Mewtwo. Unfortunately, Latias & Latios is the proverbial “two steps back” to Celebi’s “one step forward.” Latias & Latios was created with good intentions, but ultimately suffers from the same problem Entei had: it simply did not understand what exactly made its predecessor good. Though Latias & Latios closes out the Original Series on a mediocre note, we can still eagerly await the Advanced Generation series of films in hopes for a fresh take on the Pokemon movie formula.